The species in this family:Muricidae is small. 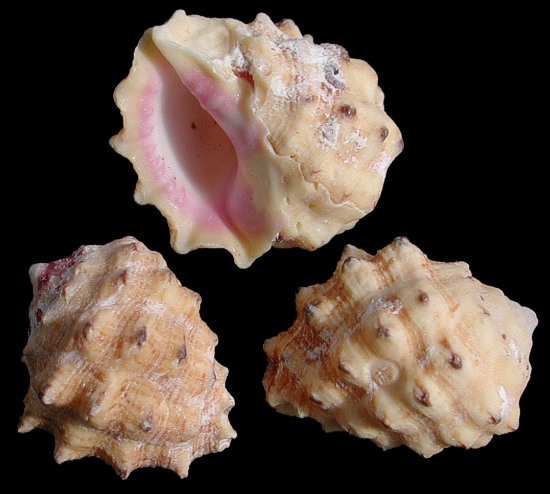 They have thick shells, a large body whorl and are covered with nodules. The outer lip is toothed on the inside edge. The aperture is often restricted by the columellar folds. Drupes are carnivorous, feeding on small invertebrates. Drupes range from the Indian Ocean East to the Northern shores of Australia and New Zealand. 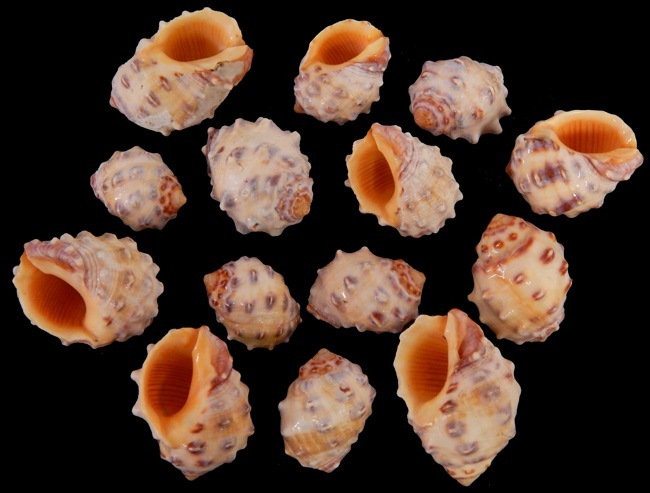 They are found near shore around intertidal reefs and rocks. They are not considered a rare find. Purple Drupe scientific name: Drupa Morum Roding. Family: Muricidae. This shell is thick, the large body whorl obscures the spire. There are several about 4 strong folds on the columella and about eight large teeth on the inside of the outer lip. The body whorl is encircled by four rows of large nodules. Color. 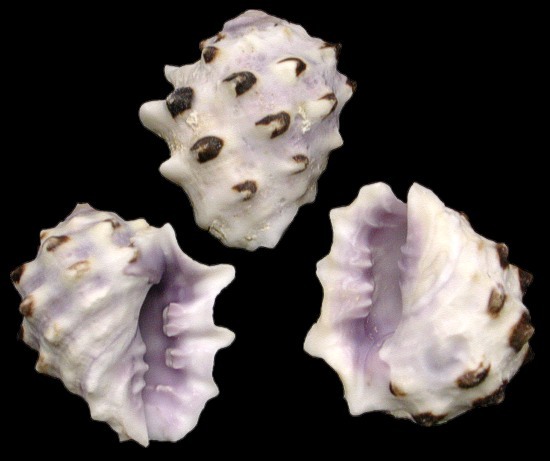 Grayish white, with black nodules; the aperture and apertural teeth are purple. The purple does not reach the lip edge. Habitat. They range across the Tropical Indo-Pacific region; preferring intertidal reefs. This species is not common but not considered rare. 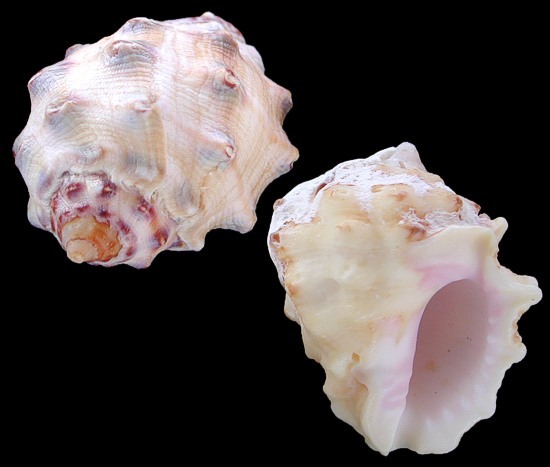 This shell has a short spire and mature examples show almost a flat top. There are about five rows of spines encircle the body whorl. Those nearest the outer lip are open-sided. The shell is a gastropod, meaning the mollusk has formed a single shell rather than matching upper and lower shells hinged together. Color. Creamy yellow. Mature species have a rich pink columella. Habitat. Indo-Pacific tropical region from the Indian Ocean East to the shores of Australia/New Zealand. They prefer intertidal reefs. They are considered a fairly rare find, but not endangered. Yellow Drupes are found across the Indo-Pacific region. They prefer intertidal reefs or near shore rocks. They like other Drupes are carnivorous, feeding on small sea invertebrates.